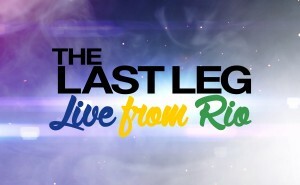 The Last Leg traveled to Rio for the 2016 Paralympics, four years after the show debuted during the 2012 London Paralympics. Adam Hills, Josh Widdicombe and Alex Brooker were joined nightly by regular guests including Katherine Ryan, Johnny Vegas, Clare Balding, RJ Mitte and Stephen Mangan as well as a host of Paralympic medalists. Catch up with The Last Leg on Channel 4’s website.